Long ago a storyteller died while in the middle of completing one of this greatest works. The main characters in that story, a prince and a giant evil raven were not satisfied with the lack of conclusion and pulled themselves out of the story to continue their battle. The prince removed his heart and using a forbidden magic sealed away the raven. Now in a town touched by fantasy and story, a young duck will become a girl. This girl will be granted the power to become Princess Tutu and recover the broken pieces of the prince's heart. However, in the shadows lurks the storyteller, Drosselmeyer, who even in death wants to manipulate people and events. Influenced heavily by both general fairy tale motifs and ballet, Princess Tutu is quite a bit different, and at times more bizarre, than many anime titles. Part of this stems from the highly stylized nature of the fundamental influences on the show. A battle sequence featuring a magical girl ballerina engaged in graceful dancing facing off against packs of evil humanoid ravens and other evil magic, isn't really all that bizarre in the context of the world of ballet, though I can easily imagine how utterly surreal it could seem to many people. If those elements weren't unusual enough, the show features influences both direct and indirect from the fantasy worlds of European fairy tales that sometimes seem perfectly normal and other times produce such odd characters as a bipedal feline ballet instructor who threatens to marry students who aren't paying attention. Adding to the surreal fairy tale experience, parts of the show are narrated by Drosselmeyer who, besides already being dead when the show begins, seems quite aware of the mutable nature of the reality of "stories" and even perhaps his own status. All of these odd elements, however, serve a distinct purpose unlike some other shows that are simply trying to be strange for the sake of being strange. The stylized fairy tale and ballet elements help the show focus and explore a number of different thematic elements ranging from love to the struggle against destiny. In the tradition of classic fairy tales, many of the darker aspects of such themes are not ignored providing for a more textured examination of the themes and ideas being raised. The strange nature of this story (and oft times I suppose it would be more correctly referred to as a metastory) even provides for the exploration of certain thought provoking existential questions in a more interesting and accessible way than typically encountered in anime more purposefully intended to be deeply philosophical. While I'm not going to claim that Princess Tutu represents some sort of groundbreaking Bergmanesque anime production, I did find it a great deal more thematically satisfying than I anticipated on starting the show. None of these thematic elements would be nearly as interesting without decent characters through which to explore the issues. As story archetype and the accompanying link to destiny is a key element of the plot of this show, several of the main characters do, initially, fall into certain stereotypes and the show has to do a careful balancing act of keeping realistically motivated characters in the context of the show's atypical setting. However, as the show continues, and the characters struggle against their roles, the characters grow beyond what is simply expected of them and several show themselves to be much more than they initially appear. Most of the main characters are a bit younger, so as expected, they do tend to be motivated by more fundamental (and somewhat less subtle) concerns than you might see in somewhat older characters. The plot element of recovered emotions also presents character growth in an unusual and highly direct way while also giving the show the chance to offer a bit of reflection on both the benefits and costs of human emotion. In taking and alluding to so many elements from previous sources, the show's plot could have easily ended up simply derivative but instead still manages to seem very fresh and inventive. Viewers more familiar with certain ballet stories and fairy tales may find their viewing pleasure enhanced but no particular knowledge is required to enjoy or understand the references used in the show. The elements they do borrow instead help to only enhance the show's fairy tale mood which is vital in helping to frame the characters and thematic issues. I will note that the episodes in first and second half of the show do have a certain formulaic element invloving their individual endings. In the very specific context and atmosphere of the show, these elements work well and do not detract from overall experience of the show. While not the single most beautiful title I've ever seen, the character design and general art work are well-suited for the type of story being told though many incidental and secondary characters have a bit overly simplistic design at times though, in several cases, this is for stylistic reasons. A lot of background work is well done and helps enhance the show's atmosphere. The animation itself is fairly good and the dancing sequences didn't seem particularly stilted or poorly done. Several of the large scale sequences at key points were well animated and for that matter, I suppose, you could say well choreographed. Given the show's heavy ballet influence, it is not surprising that the show makes good use of a number of beautiful pieces of classical music or musical reinterpretations of several famous pieces that even people who are otherwise unfamiliar with classical music or ballet might recognize. The other music of the show, unfortunately, while pleasant enough and generally fitting with the mood is a bit forgettable. Though some of that might be attributed to it simply having to coexist in the same show as various musical pieces that have such cultural resonance. 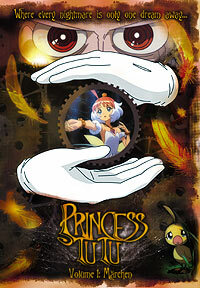 I rather enjoyed Princess Tutu and found it refreshingly creative and engaging. However, it is a very stylized show that may not appeal to everyone. I could easily see how some view find the show too bizarre at points and more action-oriented viewers might not be all that interested in conflict scenes that often resolve around ballet dancing. Viewers seeking something a bit different from their standard fare should definitely give the show a chance and may find themselves pleasantly surprised. Recommended Audience: While the show can be very cute and unassuming, it does fairly often draw on darker elements of the fairy tale tradition such as death, sacrifice, and maiming. While the show doesn't present graphic images of violence, they are discussed.